Over three years after the death of Bishop Victor Chikwe of Catholic Diocese of Ahiara in Mbaise, Imo State, tension has continued to mount over the appointment of a replacement. The development is currently tearing the Catholic Church apart. Trouble started May 21, 2013, when Fr. Peter Okpaleke, from the Diocese of Awka, Anambra State was consecrated bishop for the Ahiara Diocese, but Clergy and Laity of the diocese rejected the appointment. The two groups opted for an indigenous priest to be made bishop of the diocese. The furore generated by the rejection of Fr. Peter Okpaleke, Vanguard learnt, got to the ears of Pope Francis who promptly appointed John Cardinal Onaiyekan as Apostolic administrator of Ahiara Diocese, with the mandate to get a bishop acceptable to the people and the Catholic Church. Onaiyekan appointed Fr. 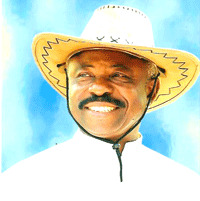 Louis Asiegbu, a professor, as the Vicar General to oversee the day-to-day running of the diocese pending the appointment of a bishop. Nine months after his appointment, Asiegbu resigned, allegedly because he didn’t have a smooth relationship with the cardinal. There were allegations that Onaiyekan neglected and rebuffed all his advice. 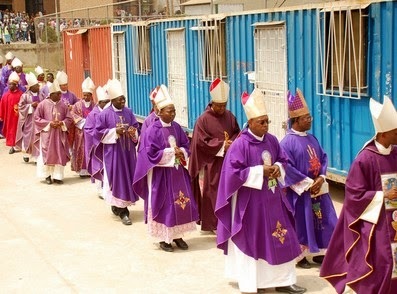 The diocesan priests, as a result, accused Onaiyekan of having a personal agenda, as he has completely abandoned his pastoral and spiritual responsibilities to the flock of the diocese, such as the ordination of deacons and priests, religious professions and confirmation. They reason that the cardinal is deliberately pressuring the diocese to submit to his planned installation of the rejected Bishop Okpalaeke; but they are unrelenting. The Cardinal in November last year, told the people that he had reached a dead end and had nothing more to do apart from installing the bishop. He recently appointed Fr. Clement Ebii, his protégé, as the new Vicar General, which has also been rejected by the diocesan clergy and the laity. To further show their displeasure, the people gathered on June 21, at St. Brigid’s Catholic Church, Nnarambia, Ahiara in Ahiazu Mbaise, for a prayer rally against what they described as injustice to the church and people by Nigerian church leaders. Speaking at the event, the parish priest of St. Gregory’s Parish, Ihitteafoukwu, Fr. David Iheanacho said the Ahiara Catholic Diocese parades over 600 priests and 500,000 faithful, noting that before the imposition of Okpaleke, the late Bishop Chikwe, an indigene, spent 23 years and 10 months in the diocese and produced several priests adjudged to be amongst the best in Africa. “Before his death also, he (Chikwe) sent over 21 names of worthy priests to be considered at his demise. The process of making a bishop is very clear in the Canon law,” he said, explaining that bishopric selection begins from the local people (priests), and thereon to the Papal Nuncio who is expected to forward his choice candidates to Rome out of which one would be appointed bishop. But in the case of Ahiara Diocese, the process was neglected. Iheanacho argued that the church hierarchy went into all manner of things to manufacture an excuse for an imposition of a pre-ordained person chosen from Awka in Onitsha Province. “Our people started asking the question: if we have up to 600 priests, is it conceivable that none of them is qualified to be a bishop? If we have that number of indigenous priests and they are seen as unqualified to be appointed bishop, have they not succeeded in destroying the credibility of those priests before the people?” he asked, maintaining that the appointment of Bishop Okpaleke to Ahiara Diocese contradicts natural justice. “I say this because the Pontiff cannot knowingly recommend what is unjust. Pope Benedict, under whose pontificate, Okpaleke was appointed, is perhaps misled into regarding Ahiara Diocese as not having competent priests to be appointed bishops. That is to say that we are nincompoops or good for nothing people. We have been asking the Pope to send down some impartial observers to look into our agitation,” Iheanacho added. On the way forward, he said he had told the Nigerian Catholic Bishops Conference, when they came to Ahiara to stop pushing Bishop Okpaleke to the diocese. “Let Okpaleke remain where he is while they go ahead to give us what we want. The church has many options,” he noted, recounting a similar incidence that happened in Enugu in 1978, the first time there was a resistance over an elected bishop. “Fr. Albert Obiefuna (then Rector of Bigard Memorial Seminary) was nominated to become the bishop of Enugu but the people refused because they said Fr. Obiefuna is from Onitsha Province. Instead of causing trouble in the Church of God, Catholic Bishops immediately (with approval of Rome) created Awka Diocese without any preparation and fanfare and appointed Obiefuna as the bishop, while Eneja (son of the soil), was made the bishop of the already existing Enugu Diocese”. He noted that if they (present Catholic Bishops) had handled the case of Ahiara like their predecessors did in 1978, Okpaleke would have been a bishop somewhere, while Ahiara Diocese would have been in peace and the Church of God booming. Also speaking, the parish priest of St. Joseph’s Catholic Parish, Otulu in Ahiazu Mbaise and president, Ahiara Diocesan Priests Association, Fr. Austin Ekechukwu emphasised the need for Ahiara Diocese to have a bishop from among the indigenous priests in the diocese. “My impression is that all these troubles are the handiwork of some senior ecclesiastical persons, who have vested interests in denying Ahiara Diocese their rights and privileges. No due process could have produced Okpaleke in the midst of Ahiara presbyterium in particular and Owerri Province at large. “What has happened is a conspiracy for which, according to him, certain eminent personalities within the church should be investigated and brought to book,” he stated. On the impact of crisis to the diocese, the parish priest of St. Paul’s Catholic Parish, Egbelu Umuhu Enyiogugu, Fr. Benedict Ogu said the inability of the hierarchy to proffer immediate solution to the problem has caused much harm than good, stressing that the crisis is adversely affecting seminarians and the entire church in Ahiara Diocese. According to him, the impasse is prolonged because Cardinal Onaiyekan refused to perform his pastoral responsibilities including ordination of priests, administering sacrament of confirmation and other sacramental functions. “He reasons that by so doing Ahiara people would succumb and accept the injustice. One thing is clear: As it is negatively affecting the diocese, it is also affecting the Holy Spirit, because biblically it is said that as you are persecuting My Church, you are also persecuting Me. This therefore brings to fore the question: ‘Should the people of Ahiara Diocese be punished because they rejected an imposed bishop on them?” he questioned. He further said that before Ahiara people rejected Okpaleke, he was already rejected by his people and fellow priests in his bid to become the sitting bishop of Awka Diocese, “Since he was rejected by his people and insisted that he must be made a bishop, they packaged him for a place they think they can maneuver,” Ogu added.